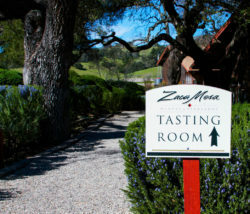 Zaca Mesa is a Santa Ynez estate vineyard and winery dedicated to Rhône varietals. We hand craft our wines with integrity using traditional methods from grapes sustainably grown in our Santa Barbara County vineyard. Since 1973, we have farmed and nurtured our vineyard to produce wines that are true to the unique spirit of our land. Our tasting room and vineyards are situated on the Foxen Canyon Trail. Pack a picnic and enjoy it in our Grenache Blanc vineyard or out on our newly remodeld courtyard. Fancy a game of chess? Play on our life-sized chess set!